Some types of onions, such as the fall-planted bunching and Egyptian onions, continue to produce new onions even when some are harvested. The Egyptian onion (Allium cepa var. viviparum) produces small bulbils at the top of its stalk in late summer. 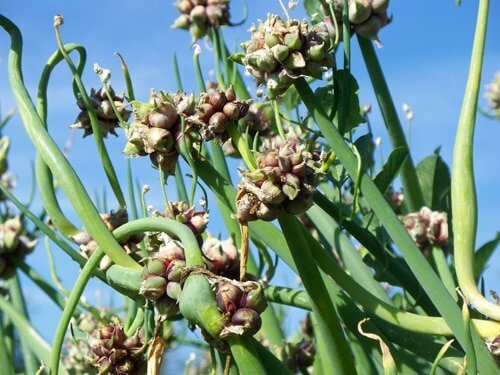 You can use these tiny onions as they are, or plant them in the fall to grow more Egyptian onions. Zones 4-8. Scarlet runner beans (Phaseolus coccineus) are usually grown as ornamentals in most people’s gardens, but they are quite edible and nutritious, both as green beans and, later, as dried beans. 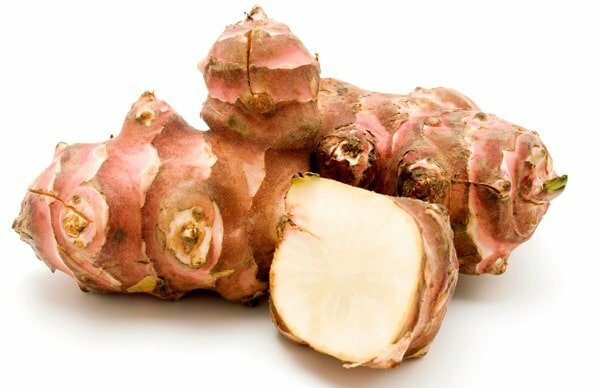 The flowers, young leaves and tubers are also edible when cooked. I grow poke. Delicious when cooked with eggs! Thanks! Yes, perennials are great. They just keep on giving! I only see 10 of the 20 supposedly in this article and wonder where i click to get to the second page of vegetables from 11 to 20 ?????? The first ten were listed at the top of the article: raspberries, blueberries and other berry bushes, asparagus, rhubarb, kale, garlic, radicchio, horseradish, globe artichokes, lovage and watercress. Angel was asking about the second set of 10. They are listed in the rest of the article. Up here in mid Ontario, I grow rhubarb, sorrel, Egyptian onions, , Jerusalem Artichokes, lovage, chives, garlic chives, plus herbs and annual vegetables, and haskap berries, red and black currants and gooseberries. You didn’t mention hosta! We have been enjoying the early shoots of hosta in the spring for a few,up years now. They’re delicious and prolific! We’ve been trying to get on board here in 7B. We have: hosta, rhubarb (so far), longevity spinach (new this year), sea kale, skirret, yacon, asparagus, and garlic, along with any berries, trees, and other shrubs we can manage to find or start from seed. We’ve had a lot of disappointments and critter problems, but love the challenge and feeling of success and accomplishment that comes with the permaculture/forest garden ideals. I wish you all adventure and success! I grow New Zealand Spinach. It is a vine-like ground cover, that my father remembers from his childhood. Give it a bit of shade (like under my grapefruit tree) and it will spread everywhere, producing lots of meals. 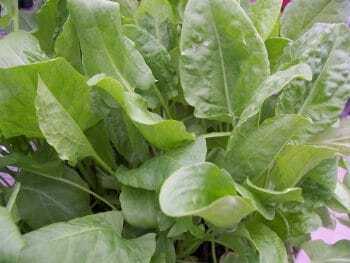 Not actually a type of spinach, it is listed in Wikipedia as Tetragonia tetragonioides, a leafy groundcover also known as Botany Bay spinach, Cook’s cabbage, k?kihi, sea spinach, and tetragon. Delicious, and doesn’t cook down to nothing, like real spinach does. In DK the Scarlet Runner Beans (Phaseolus coccineus) is considered poisonous. What is the difference are we more cautious? Scarlet runner beans contain less of the toxin lectin phytohaemagglutinin than do kidney beans, which is why both scarlet runner beans and kidney beans should only be eaten cooked. After thorough cooking, both of these beans are fine for consumption. Just don’t eat raw. Must be cooked, sauteed, steamed before consumption. What an exciting post! I can’t wait until we can implement permaculture principles in our own garden. Pinned this for future reference. The vegetables you outline are inspiring! I grow quite a few “perennial” vegetables. But many of them are not perennial in the strict sense of the word but annuals or biennials that self seed. Bronze leaf Fennel (will become a weed if allowed to seed) used for the leaves, not a bulb. I live in town and have a tiny city lot. We also have a lawn with real grass for the dogs. 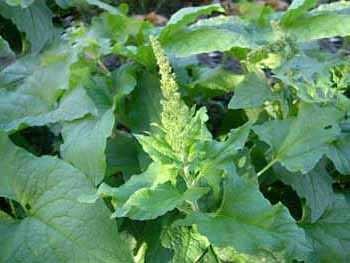 It is easy to incorporate perennial veggies in flower beds. There are no raised beds so as far as anyone walking by thinks we just have beautiful landscaping. Fiddleheads come from the Ostrich Fern, which is #16. Just saying . for those of you who like the wild blackberry try getting you some Dewberries they ripen faster and earlier and no thorns and lower plants . To stop the deer from munching away at your trees all you need to do is blant a thorny vine or two about a foot and a half away from the base of the tree. I use black Berry’s. The deer might actually be helping you anyway. You don’t want the tree producing fruit until it’s fully matured. It takes away from its growth. Deer! Get some bars of “Irish Spring Bar Soap”; put them in old white crew socks; attach them to the branches of the trees (or to the trunks) so they hang down or to stake in the vegetable/flower garden. They do not dissolve quickly. They are nontoxic to the vegetation, ground and/or to you (despite the smell). Deer don’t like the smell and will usually leave the vegetation alone. Still, watch out for the ticks the deer bring into your yard. Lyme Disease isn’t any fun. I find that can work well, but doesn’t always work, especially when they are really hungry. A fence is usually your best bet. We found blood meal repellent didks thst worked against the deer. They might run quick thru the garden, but don’t stop to eat. We see them around, but not close to the garden! Hostas. The young leaves are so tasty. Balloon flower for the roots. Edible chrysanthemums and chives. Both so prolific I have to make sure they doesn’t take over the garden. Autumn olive. The bush can survive most climates and the berries have about 20 times the Lycopine of tomatoes and so much pectin I use it for jelling other fruits. These are great ones! Thanks for adding them! But readers, please do note that Autumn olive is invasive in parts of the United States. Does this apply to a specific variety of hosta, or are all varieties edible? I have been watching Geoff Lawton videos and I am hard at planning my long term food forest. I have so many questions! One big one is about regeneration: for the ostrich ferns, if you’re cutting off the fiddles, aren’t you just taking the plant before it grows into something that would look nice in your yard? Similar question with the daylilly bulbs – aren’t you digging up the plant and terminating it when you eat it? For kale — we’ve had the same kale in our yard for a year, and lately it’s been growing buds and trying to flower. The shape of the plants has changed dramatically, and the leaves are getting skinnier. I took that as a sign to pull them. No? You Americans astound me. Here in Australia we take flowering as a sign that we will collect seed soon, not as a sign to disregard a plant. Obviously you do not eat ALL of the ostrich fern or ALL of the day lilly, that would be counter productive. Instead you eat some and leave some. It really can’t be more simple. Take it easy, Crocodile Dundee! She was just asking a question. Matthew you are absolutely right! Best to remember the importance of the teaching moment over the frustrating lack of common Sense. As for you Toni my dear, when a plant is about to make seeds(which you can harvest and dry and store instead of having to ever buy) the plant will change, it’s putting all it’s energy into reproducing. You can cut the plant back( YouTube it….super great videos with method, many opinions, use what you like) or let it go! Collect the seeds and start over. Alternately just let the plant do it’s thing..remember to keep a journal! Always write down your observations…it will help in coming years. …frustrating lack of common sense. Rude, and wishing the “dear” best of luck does nothing to counteract such poor manners. This is a safe place, for pete’s sake. Native Indians used to harvest Fiddleheads and they would take 3 in the group, leaving tobacco leaves as a blessing. The tobacco would help fertilize ferns during the season. How beautiful! Thanks for sharing that! Thanks for this article. With limited garden space and too much backyard shade this definitely add some options. Just ordered the book for my Kindle and can’t wait to read it. pouvez vous me vendre des graines de ces mini tomates ou bien ou puis-je m’en procurer. Merci et bonne récolte . Please tell me more about this tomato plant. I live in Nova Scotia Canada. It sounds like it might grow here. I do not know how old this thread is, but…do you have and would you be willing to part with some of those “tomato weed” seeds. I really would like to get my hands on a tomato that is verifiable cold hardy. I am in zone 4, really close to zone three. I am a transplant from another zone and have been trying to get my hands dirty again, but the last few years I have been trying have yielded meager results at best. The season is a lot shorter than where I am originally from and I have been buying seedlings and transplanting in a small yard area. I have gotten the permaculture bug and am trying to go perennial with some edible vegetables and flowers, along with some herbs. Sorrel will winter over in protected spots of Zone 4. I live in Las Vegas, which zone is that, please? I wish scarlet runner beans were hardy to zone 4! However, all the literature suggests that they will be perennial above about zone 9, in places with very mild winters. In zone 4, I can barely get them to ripen in time to save the seeds for planting next year. Thanks for the comment! I will scratch that one off my list for now. I will not totally disregard it though. I may be able to add it in somewhere along the way after I get going full steam. I will most definitely be picking up that book! -I do have to add that Hosta’s are very edible and delicious when the shoots are young and tender! H. Montana and H. Sieboldii are the two favored varieties. Thanks for the info! I did not know scarlet runner beans were perennials either! Think I’ll plant some up against the trees between my yard & the neighbour’s & up against the fence on the other side. Have a few of the others mentioned here too & close to where I live we have fiddleheads & wild leeks. The leek leaves are milder than the bulbs. I freeze them (the bulbs too) which can be added to soups, stews and such in winter. A few leaves add a nice zest to salads when fresh. The slightly stronger older bulbs are nice pickled as well. Thanks, Rebecca! Yes, watercress is a popular perennial water garden crop for those who have small ponds or other water features in their garden. We just moved, so we’re starting over with our garden. I’ve only just grown asparagus as a perennial but scarlett runner beans and kale both grow well here. I will be pinning this post for future reference. Thank you again for sharing at the HomeAcre Hop! Hope to see you tomorrow. Great list! We grow a very few (berries, kale, rhubarb, garlic). I can’t wait to have a garden! Apartment life can be so frustrating. Thank you for linking up with Wildcrafting Wednesdays! 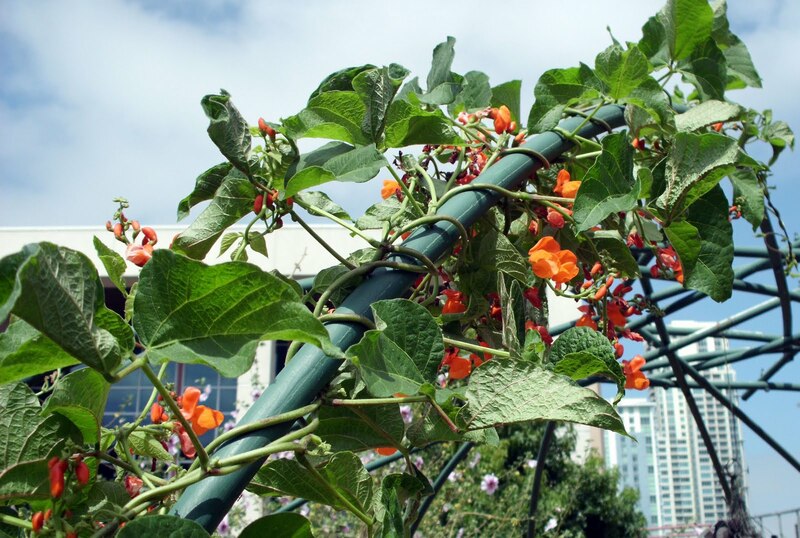 Some perennials, like Scarlet Runner beans, can be grown in pots on a balcony or patio, and transplanted later. If you have a little outdoor space, don’t give up on gardening! 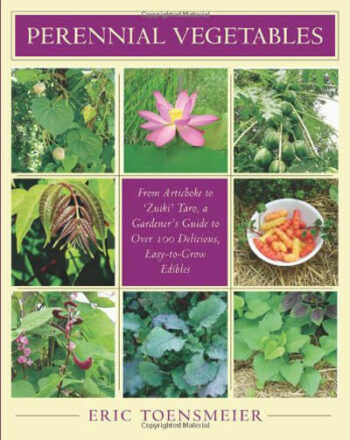 I recently purchased a copy of ‘Perennial Vegetables’. It’s incredible! I do have a couple to add. Down here in TX my fennel is going on its second year with bunches of new bulbs growing from the original plant and my chard is starting its fourth year. Great Article. I have both books and think they are wonderful resources. I’m planting a new vegetable garden this year. I’m putting in as many perennials as possible. Nice post! Thank you for the resources. Fantastic article! “Thrives on neglect” is the magic phrase for me. I seem to kill everything! 🙂 Visiting from the homeacre hop. Thank you for this list! So far, I have not started growing perennial vegetables but would like too. This information is helpful to know and I will have to check into that book. Thanks! Thank you for this! I’m very excited to add some perennials (I’m thinking Scarlet Runner Beans) to my Tangle of Weeds… um… garden… this spring. LOL! Scarlet runner beans make a lovely tangle! Nice list! Thanks for participating! Excellent article! I just shared this on my Facebook page so everyone can learn more about planting perennial vegetables. Thanks! Thanks so much for sharing the love!! This is so wonderful. I got Gaia’s Garden as a gift and have been VERY slowly reading it but haven’t really dug in yet. Thanks for the nudge. Just so sensible a way to garden. How nice to see fiddleheads heading this post! We harvest them wild here in New Brunswick, and they are my number one favourite veggie! I didn’t know much about other perennial edibles, thanks so much for the info! When do you harvest fiddleheads and how do you cook them. Recipe please. They are harvested in early spring and can be prepared the same ways you’d prepare green beans. Fiddlehead quiche is awesome. Just use a spinach quiche recipe and substitute with cooked fiddle heads. I found this post fascinating. I had not thought about perennial vegetables in this much detail before. I adore asparagus and rhubarb, but was interested to learn about the many other perennials that are out there. We love having our perennial asparagus and berry bushes. I would love to see about doing some more. Thanks for the great info on this!